Call 301-986-6900 or contact us online to discuss your outdoor kitchen dreams! Not only is an outdoor kitchen an area to prepare and eat meals, but it is also a stylish space for entertaining guests. There are many designs on the internet that you can check out for ideas. However, we find that each project is unique ranging from elaborate full kitchen designs to less expensive grilling areas. So what should an outdoor kitchen include? It usually starts with built-in grills or outdoor stoves that are integrated into the design. This gives homeowners a luxurious cooking area, where food can be stored and prepared in a space specifically tailored to the area available. This area will become the focal point of your outside entertainment, custom designed from decorative stone, wood features, or sculptured ceramic. It’s best to have everything easily accessible outside. Most outdoor kitchens include a mini-refrigerator, sink, drawers and cabinets so you do not have to make continuous trips indoors. 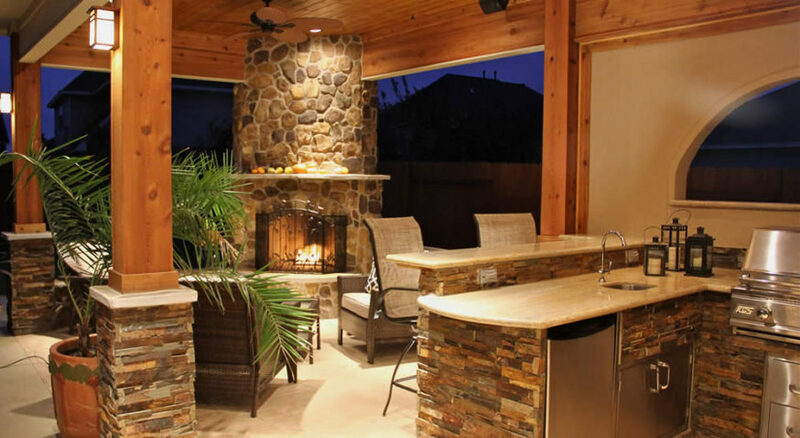 There are many ways to integrate an outdoor kitchen into your existing home or patio. The key is to decoratively furnish it with tables, chairs and accessories to make it blend in and complement the existing landscape. An outdoor kitchen can naturally blend in to create an inviting space by incorporating hanging plants, small trees and shrubbery into the design. Outdoor kitchen designs are highly customized. It’s hard for most people to look at a few photos and realize which features might fit into their unique space. By hiring a pro, you get someone that has practical experience with design, material options, permits and budgeting. By adding an outdoor kitchen and entertainment area, your backyard will become an integral to your summertime enjoyment. Sit back and watch the kids swim in the backyard or pool as you barbecue your favorite meals. Or kick back with a cold cocktail and enjoy the fresh air and sounds of nature. Either way, you will enjoy meals as you dine in the comfort of your own backyard oasis. To discuss ideas and get a free quote, contact us anytime.